ABOVE: The three-star Hotel Villa delle Palme ("Villa of the Palms") has a large fenced garden and a rooftop observation turret with sundeck. If you're traveling with children or looking for a resort experience during the summer, try staying at a villa or resort hotel near the water or in one of the Lido's residential neighborhoods. Many of these hotels have private gardens where you can relax after a long day of sightseeing. Some of these hotels aren't open during the winter months. If you're visiting the Lido out of season, see our listings of hotels on the Lido's main street. If you're bringing a car, read our ACTV No. 17 Venice-Lido Car Ferry article. 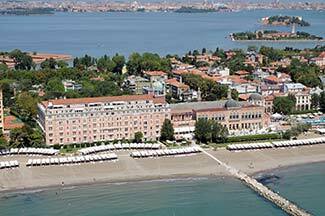 The Villa Laguna is the only Lido hotel with a private waterfront location facing the Venetian Lagoon and Venice's historic center. From your room or the waterside bar and restaurant terrace, you can enjoy views of the Campanile di San Marco and other Venice landmarks. The hotel has its own water-taxi pier and is only a short walk south from the vaporetto and airport-boat station. From the Lido S.M.E. vaporetto and airport-bus station, it's about a 10-minute walk toward the north along the waterfront promenade to the Hotel Russo Palace. The hotel was built as a private mansion in the 1930s and has 22 rooms. The Art Nouveau-style "Villa of the Palms" was built a century ago as a private mansion. The hotel, which is surrounded by a large garden with 30 palm trees, has a belvedere with a sun terrace above the roof where you can enjoy views of the Lido, Venice, and the Venetian Lagoon. For location, the Villa Cipro is a winner: It's just off the Lido's main street, in a quiet neighborhood but within a few minutes' walk of the Lido S.M.E. vaporetto and airport-boat station. Restaurants, shops, and beaches are all nearby. The hotel has 20 guest rooms, a bar, and a private garden where breakfast is served in good weather. This 37-room hotel faces a canal on the Via Lepanto, south of the Lido's main shopping district. Higher-priced penthouse suites have Jacuzzi whirlpool baths and private terraces with views. 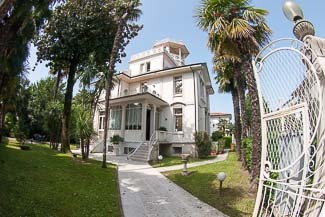 The Byron is a few blocks south of the Gran Viale Santa Maria Elisabetta, in a quiet residential neighborhood. It has 37 rooms (including connecting doubles for families), a garden, and an American bar. The 11-room Villa Casanova is a "bio first class inn." It's housed in a 1930s villa that has been renovated with non-toxic materials such as Travertine marble, cork, and oil-polished wooden floors. Amenities include free Wi-Fi, free baby cots, a bar, a private garden, and an organic breakfast buffet. (Free parking. With 23 pet-friendly rooms and a location just south of the Gran Viale Santa Maria Elisabetta, the Villa Edera is a convenient hotel if you like being near (but not on) the Lido's main shopping and restaurant street. During summer, breakfast is served in the garden. The Pannonia has more of a "design hotel" vibe than the usual Venice or Lido hotel, with modern guest rooms, stylish public rooms, and contemporary art inside a renovated villa that was built by an aristocratic family from Eastern Europe in the early 1900s. The hotel also has a garden and free Wi-Fi. It's located just a few minutes from the ACTV and Alilaguna waterbus station, about midway between the Venetian Lagoon and the Adriatic beaches. This modern 42-room hotel is only a few minutes on foot from the Lido S.M.E. waterbus stop, shops, and restaurants. It has a garden, a bar, and a "pets stay free" policy. You can rent bikes at the reception desk. If you're on a budget, La Pergola may be right for you: It's a couple of blocks north of the Gran Viale Santa Maria Elisabetta, which makes it easy to reach from the public waterbus station. The hotel has 14 rooms (all with free Wi-Fi), a patio, and a garden where breakfast is served on sunny days. The Bed and Breakfast 500 is an easy walk from the Lido S.M.E. boat station. It's located just across a canal from the Via Lepanto, which leads south from the island's main shopping street. The B&B has five air-conditioned rooms with private baths, a garden, and a kitchen that guests can use. This tiny (three-room) bed and breakfast offers its guests a number of perks, including free Wi-Fi, free parking, and the use of a refrigerator. The Casa della Rose is slightly inland from the Lagoon waterfront, about 500 meters or a third of a mile from the Lido S.M.E. waterbus station. This converted Palladian-style villa is just inland from the Lido's Adriatic beaches, about a 15-minute walk from the Lido S.M.E. vaporetto and airport-boat stop. (If you're traveling with heavy luggage, you can hire a taxi for the 800-meter or half-mile distance.) The Gabriella's self-catering apartments are convenient for families and couples traveling together, and the rooftop observatory offers great views of the Lido, Venice, and the Adriatic Sea. You'll need to book early if you want to nab one of the two guestrooms at Casa Robinig, which is on a residential street just north of the Gran Viale Santa Maria Elisabetta. The B&B's reasonable rates include Wi-Fi Internet access. Movie stars flock to this Moorish-style palace during the Venice Film Festival. The Excelsior is a long walk or a short taxi ride from the Lido's center, but it can be a good choice if you're looking for a swanky resort hotel with a swimming pool, tennis courts, a beach club, and a private shuttle boat to Venice.